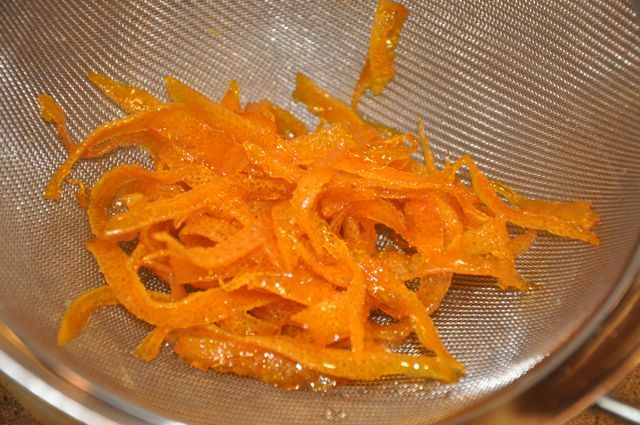 Candied Orange Peel is very expensive to buy ($20 per pound and up for the good stuff), but relatively cheap and easy to make. This is especially true when you consider that orange peel is usually just thrown away. What’s more, the candied citrus you make at home will taste better than anything you can buy and be free from any chemical preservatives. 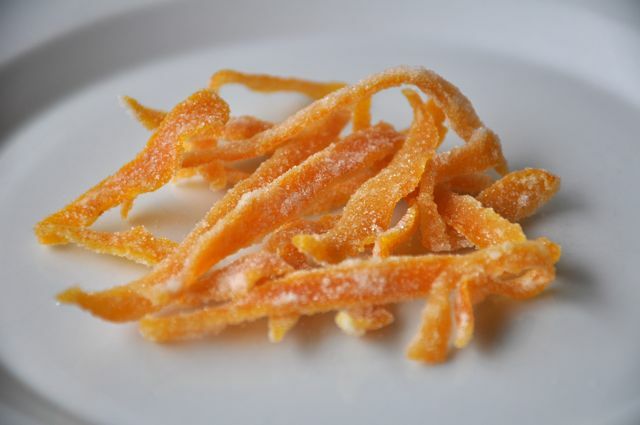 A lot of candied orange peel recipes call for using the entire peel, including the pith, but I find this to be pointless. 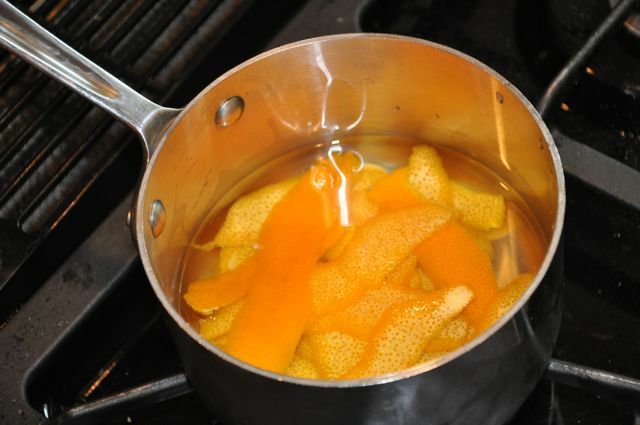 All that boiling and sugar is intended, for the most part, to change and mask the taste of the pith because it is yucky! I sidestep all of that by removing almost all of the pith and focusing on the zest. Here’s what you need to make this sweet treat. Note: If you have more oranges, simply double, triple or quadruple this recipe. It scales up really well. 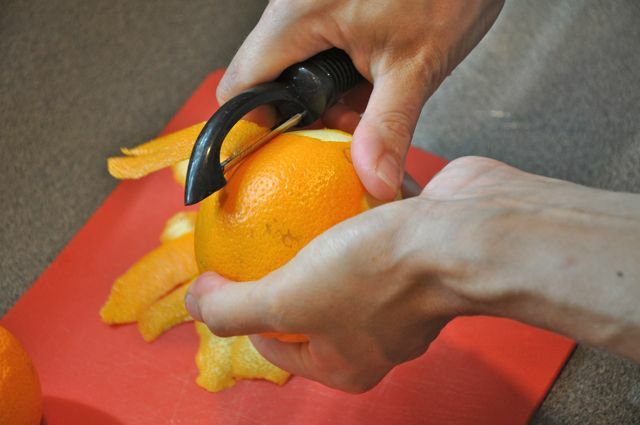 Using a vegetable peeler, remove the outer layer of the skin of two oranges. Take care to not take off the pith, that’s the white stuff. If you get some of the white pith, just scrape it off with a small paring knife. Place the peel in a small sauce pan and cover with cold water. 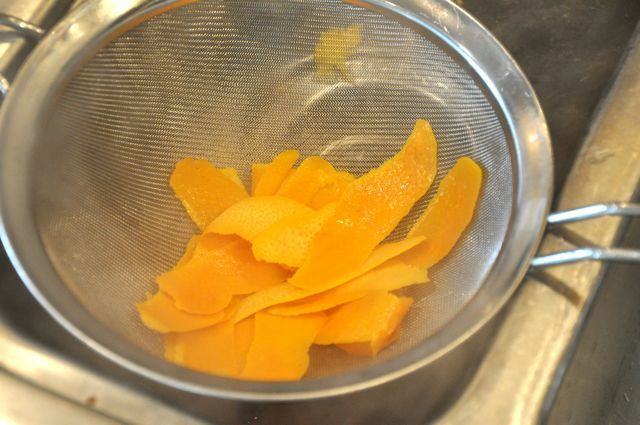 Pour the peels and water over a strainer, discarding the water. 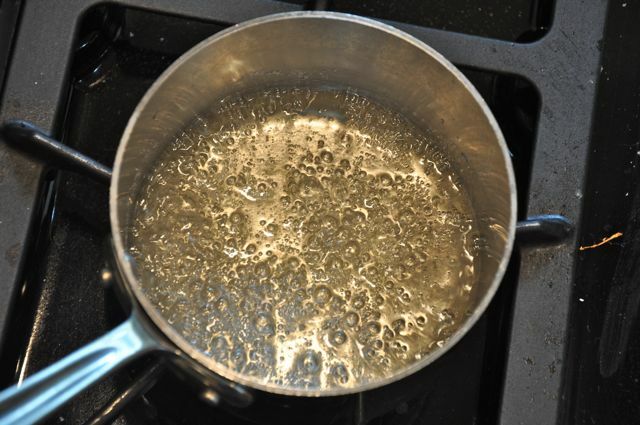 After you pour the peel and water through the strainer for the last time, add 1 cup sugar, 1 tablespoon of corn syrup and 1/3 cups water to the now empty saucepan. 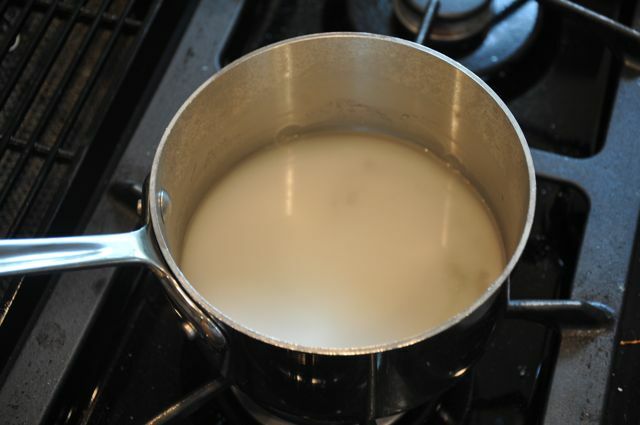 Bring to a low simmer, not a heavy boil, for 6-7 minutes. It will be around 230 degrees F, but thanks to the corn syrup, you don’t have to worry about that too much. 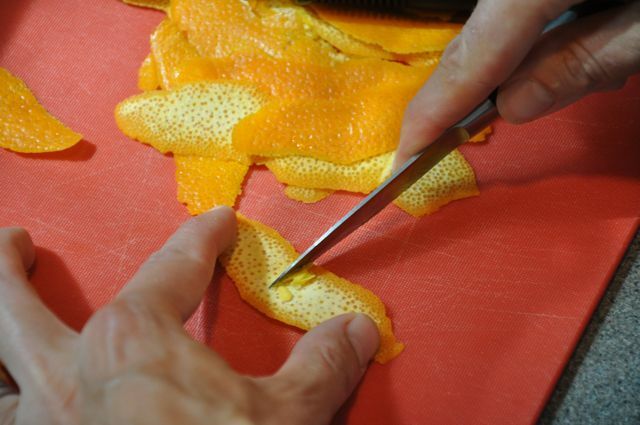 In the meantime, slice the peels into strips (or whatever size you want). Add the peel to the hot syrup and give it one quick stir to coat. 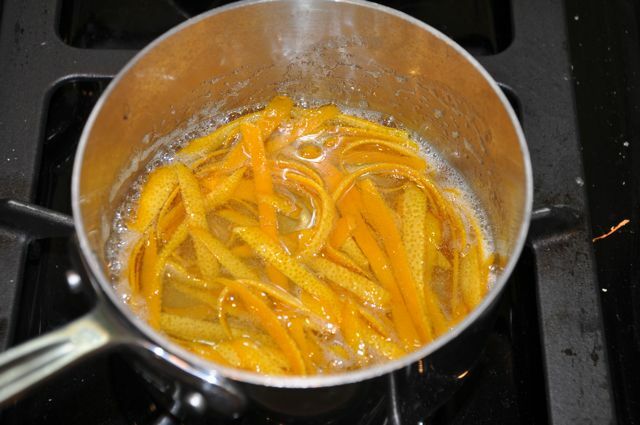 Reduce the heat and leave the peels on a very low (the lowest) simmer stirring every 8-10 minutes until the peels are translucent, about 45 minutes. Drain, reserving the syrup if you like. This extra-concentrated orange-flavored syrup makes a great sweetener for cocktails or ice tea. What a fantastic color! WARNING: If you try to eat one right now, it will burn your mouth. How do I know? Just trust me. Put the remaining cup sugar in a rimmed dish like a pie pan and place a rack over a rimmed cookie sheet next to it. 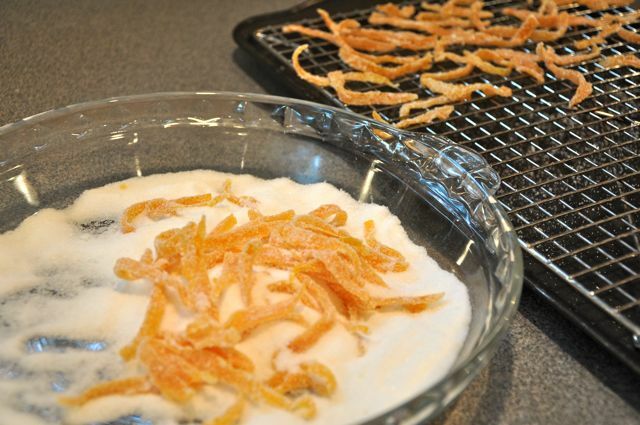 Roll the candied peel in sugar and then place on the rack to dry. 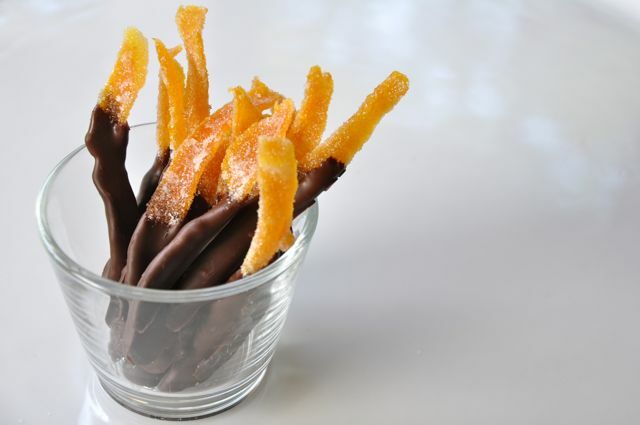 Candied orange peel is delicious on it’s own and, like most things, its even better dipped in chocolate. Also great for mixing into cookie dough or garnishing cakes. Here’s another little secret. Now that you know how to candy orange peel, you basically know how to candy any citrus peel (grapefruit, lemon, lime, even kumquats). Go crazy! 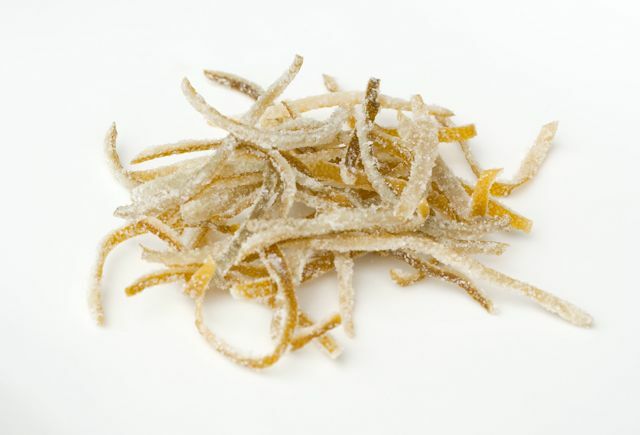 Here is some candied lime peel. ohmigosh – I want to make some right now! 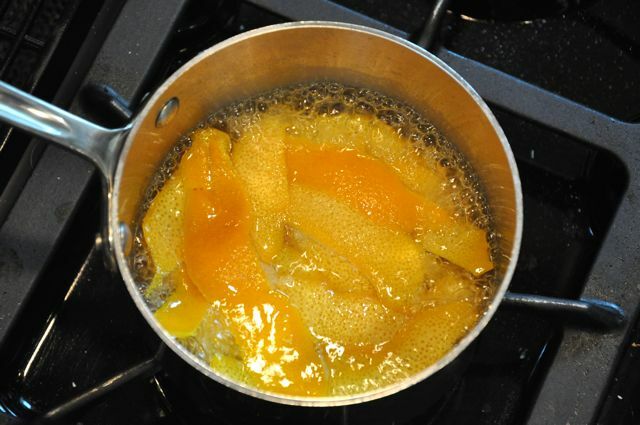 Let me clarify one thing – from looking at the directions, I thought you were supposed to add the sugar, etc… after draining the third time – while leaving the orange peel in the pot. Once I got a little further, it seemed that you were meant to remove the peel, put aside, and start with an empty pot. Right? Yes, that’s right. You boil the peel several times to make the final product less bitter. You add the peels back to the pot after you’ve made the syrup. I REALLY have to do this with lemon peel now. Thanks for the step by step, really helpful. 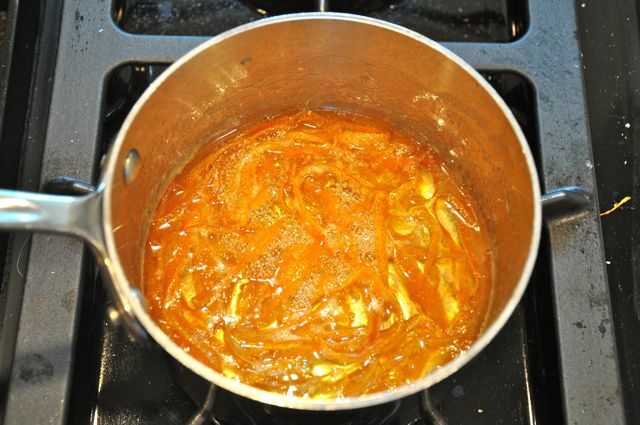 After the candied orange zest has been rolled in sugar, it can be stored for a long time. I would say at least 1 month at room temperature (probably longer, although I’ve never tested that theory). If you store in an airtight container in the fridge, they will last even longer, at least 3 months. If you dip it in chocolate, I would use it more quickly. Still, if you temper the chocolate, it should keep for at least a couple of weeks at room temperature. Hope this helps. If you do make it, let me know how it turns out. I do not have corn syrup. Can I just make this with sugar only ? Can I repeat the process for all citrus fruits ? 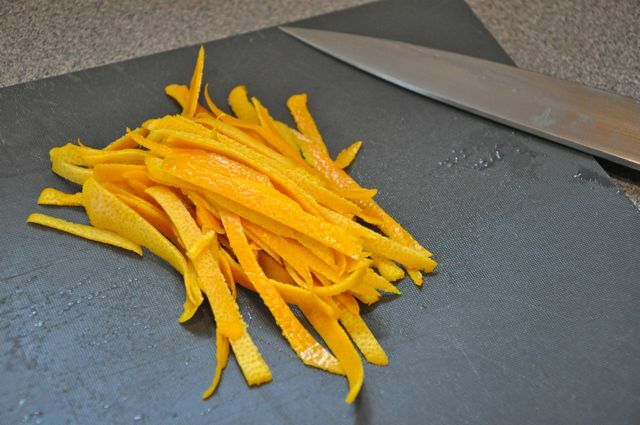 Can I use these candied peels for fruit cake ? The purpose of the syrup is to discourage the sugar from reforming into crystals. If you don’t have corn syrup, you can use glucose syrup, golden syrup or even honey. 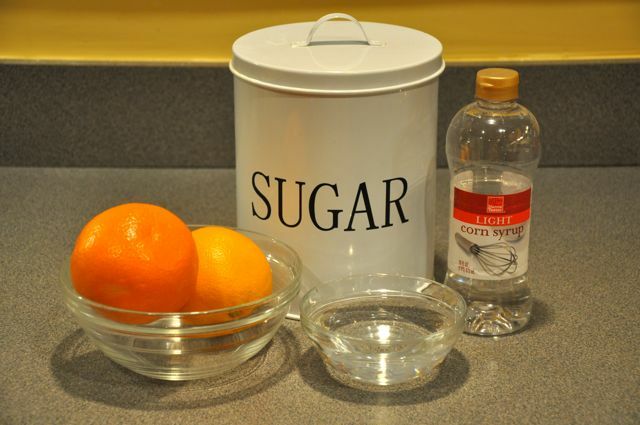 Yes, you can use this process for all citrus fruits. Yes, you can use the candied peels for fruit cake…in fact, I would encourage you to do so. I LOVE fruit cake. Would honey work as well as the corn syrup, or do you recommend the corn syrup. I tried the other day to make candied lime peel, following a different recipe to yours which said only to cook the peel in syrup for 10 minutes or so. It didn’t really turn very translucent and isn’t ever so nice, so I’m thinking I didn’t do it for long enough. Is it possible to take what I already did (a couple of days ago) and just put it back in some syrup and cook for a bit longer, or am I stuck with what I’ve got now? It took forever to peel those limes! Ummm. I’m not sure. I would be a little bit surprised if it would work. However, if you really don’t like the peels the way they are now, what do you have to lose? I tried anyway as, like you said, I had nothing to lose. It only made the peels even tougher. I’m quite disappointed as I put a lot of time into this, but I’d like to try again, and follow your recipe this time. Would you suggest orange peel as one of the easier peels to candy? Ideally I’ll move onto lime as I want to add it to my mincemeat this Christmas, but if you think orange peel would be an easier first step then I’ll do that first. Thanks! Hi Heather. I finally got around to trying again, following your recipe this time, and it worked wonderfully with orange peel. Thanks for your advice! I will try again soon with lime peel but I need to work out a way to keep the temperature low – even on my lowest gas ring at its lowest setting, after 20 minutes of heat the syrup was boiling fairly rapidly. Oh, one more question – do I use the same technique to candy slices of citrus? How wonderful! Regarding the technique, I believe that it would work for any type of citrus. I would encourage you to find a way to lower the heat. The problem, as I understand it, is as the sugar boils, the sugar has a tendency to want to form crystals. The use of corn syrup retards this process, but low heat is still the name of the game. Maybe you could remove it from the heat periodically or you could construct something to lift the pot higher on the stove and thus farther away from the burner. Thanks for updating me on your progress. This is an amazing recipe, I am off to the store to make these right now!!! This is a perfect addiction to my Christmas Cookie/Candy plates that I give out! Thank you! How long does it take the peels to dry? It depends on the humidity, but hours for sure.